A rare Native American canoe thought to be more than 250 years old has been found on a family estate in Cornwall. The birch bark canoe was discovered in a barn on the Enys estate near Penryn. It is believed the Canadian boat was brought to Cornwall by Lt John Enys who fought in Quebec during the American War of Independence. The canoe will be preserved and put on display to the public at the National Maritime Museum in Falmouth before being repatriated to Canada. Historians believe the boat could possibly be one of the oldest birch bark canoes in existence. The museum's boat collections manager Andy Wyke said: "Lt Enys sailed from Falmouth in a packet ship to join his regiment in Canada to relieve the city of Quebec which was under siege from the Americans. "He fought many military campaigns and toured the area for his personal interest - discovering this canoe along the way. "It's incredible to think its legacy has been resting in a barn in Cornwall all this time." 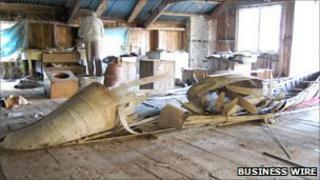 Wendy Fowler, a descendent of the Enys family, called the museum to request they look at the canoe lying in the estate's barn. "The estate is very special to us and holds many secrets but I believe this is the most interesting to date," she said. "The maritime museum is brilliantly ensuring and repatriating another element of our great family history and I'm most grateful that my great, great, great, great, great uncle's travels have led to such a major chapter of boating history being discovered in Cornwall." Capt George Hogg, archivist and museum trustee, said initially when the call came in from the estate, the museum had no idea of the importance of the find. "We knew we had something special, but having worked with the British Museum on the artefacts and the Canadian Canoe Museum in Peterborough, Ontario, we now believe that this is one of the world's oldest birch bark canoes. "This is a unique survival from the 18th Century." The canoe will be repatriated in the autumn and the Canadian Canoe Museum will carry out further research on where the boat may have been built and by which tribe. The canoe is expected to go on display at the National Maritime Museum in late January.